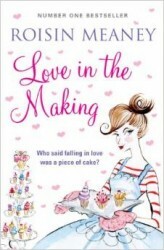 Hannah Robinson is just about to open the doors to her new shop Cupcakes on the Corner when out of the blue her boyfriend Patrick announces that he’s leaving her for another woman. Faced with starting a business on her own, Hannah begins to wonder if her life-long dream has just turned into a nightmare. So her best friend Adam sets his birthday as a deadline – seven months to make her shop a success, or walk away from it all. And as Hannah immerses herself in early-morning icing, she soon discovers that she’s too busy to think about Patrick and his now pregnant girlfriend . . . or to notice an increasingly regular customer who has recently developed a sweet tooth for all things cupcake . . . But while Hannah is slowly piecing her life back together, family friend Alice’s is falling apart. Her husband Tom’s drinking is getting out of control and things are about to get a whole lot worse. As the seven-month milestone approaches, Hannah must decide her future. And while she’s figuring out what’s really important, it becomes clear to everyone that happiness in life, and in love, is all in the making.